A delicious and easy to throw together grilled sandwich and it has fresh mashed avocados on it! Need we say more? Defrost chicken mayo overnight or alternatively defrost on very low heat in microwave until defrosted. Spread the chicken and mayo over one side of the bread. Sprinkle the cheese, olives, jalapenos and pepperdews over the chicken and mayo. With a fork, mash the avocado and spread over the other bread slice. Add salt and pepper to taste and close sandwich. Spread butter on the outside of the bread and Microwave for 1 minute and then place under a grill or in frying pan. Over medium heat turn every one minute until crispy and golden brown. 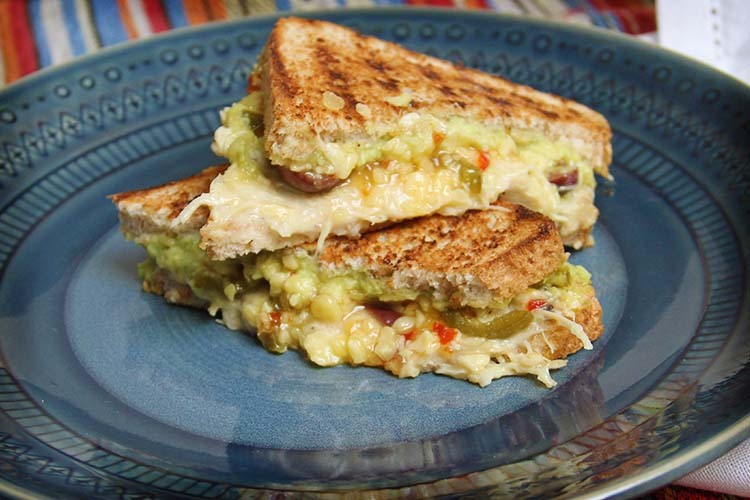 Treat yourself with a grilled chicken and mayo sandwich topped with mashed avocado, jalapeno, cheese and pepperdews. A yummy recipe that everyone will enjoy.